This week on HWLQ, our challenge came in the form of a 13' foot wall mural! More on that in a sec, but first, meet Tracy. Tracy lives in a spacious condo with her boyfriend and 2 dogs. She admitted to having no clear sense of style, often buying little pieces she likes with the hope that they will all fit together. While Lisa and I would strongly encourage buying things you love, sometimes it's hard to make everything work and your collections get lost. We had some solutions in mind, and otherwise, Tracy was looking for a comfortable, pulled together look, and the crew was more than willing to oblige. Lets talk wall color. The running theme for the room/inspiration/concept was a contemporary African influenced, relaxed style. This came from Tracy's love of African art and her extensive collection of mixed media pieces. 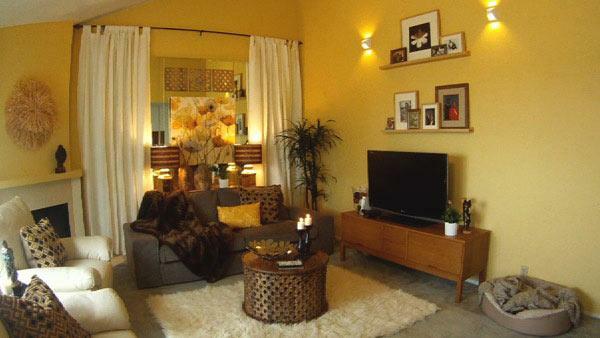 For the color, we chose a buttery yellow that added instant light and lifted the room up. Regardless of color though, anything to cover up a dated mural was in order. Her walls were quite tall, and in the center of the room was a floor to ceiling "paint by numbers" kind of deal. It had faded and gotten splotchy over time, and although assuredly looking terribly stylish circa 1985, needed to go! An even coat of tinted primer took care of it, and once mural-free, we moved on to the furniture and accessories. Style and comfort was key, so Lisa brought in 2 super comfy white leather recliners. Tracy can spin them around to enjoy the view from her balcony or watch T.V. About the entertainment, we brought in a sleek new media piece that holds all her components and hides the clutter with garage-style rolling doors. An awesome low sofa in a charcoal corduroy makes a high-end statement for a vignette we created with some existing mirrored walls. Mirrored walls can look very dated if not done well, so to avoid a time warp, we hung simple white curtains that soften the wall and create the effect of another window. A sofa table behind acts as a perch for Tracy's African art collection and 2 brass lamps to add drama. An inexpensive painting from Cost Plus World Market hung in the middle of the mirrors blends in all the colors we used. As far as decorative accessories, Lisa found some incredible fabric at Ethnic Arts in Berkeley that she made into pillows. Some floating shelves above the T.V. add architectural interest and give her photographs a home, while emphasizing the height of the ceiling and drawing your eye up. A gold silk pillow and mink throw on the sofa add a touch of luxury and fulfill my hedonistic craving for anything fur. :) A tribal-inspired round coffee table on a new ivory flokati rug add interest and texture.